This post has been sponsored by Nielsen-Massey Vanillas and Pure Flavors. All thoughts and opinions are mine. Citrus, Date and Almond M’hencha with Orange Blossom Honey Syrup – A delicious, exotic Moroccan delicacy! A sweet, date and almond paste wrapped in honey syrup soaked filo pastry. It tastes just as amazing as it looks! A few years ago, I introduced my husband to baklava, and it was love at first taste. He couldn’t get enough of the addictive, rich, crunchy, syrup-soaked filo layers and the nuttiness. 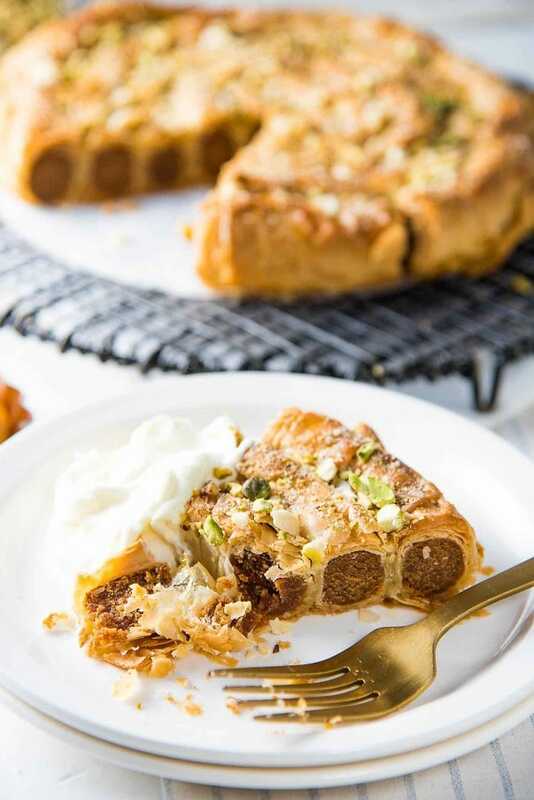 So when I first got the chance to try M’hencha – a “cake” made with sweetened almond paste wrapped in flaky filo dough, I knew right away that I had to acquaint my husband with this glorious Moroccan dessert (a relative of baklava in terms of taste). But it did take me a while to perfect this. The end result is this deliciously exotic, but not too rich, Citrus, Date and Almond M’hencha with Orange Blossom Honey Syrup, and I’m going to share with you guys all the tips I learned while making almond m’hencha. 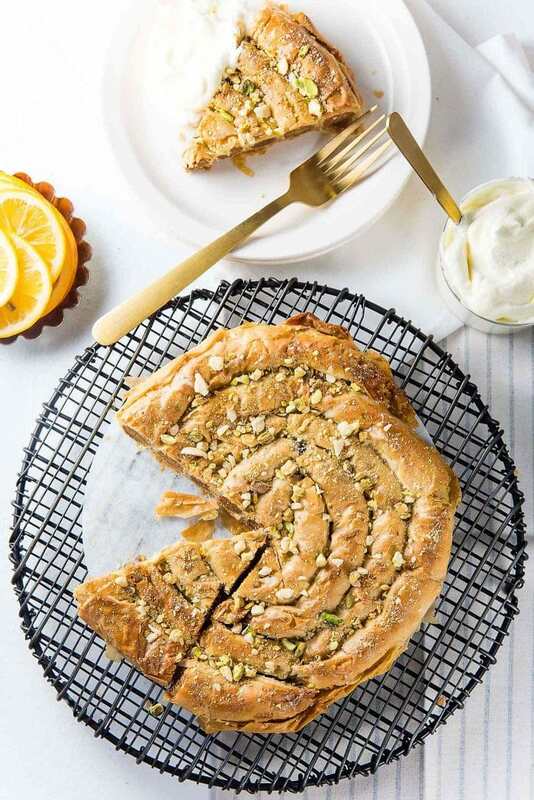 This gorgeous Moroccan dessert is also called “almond snake” or “snake cake” because of the way the filo is wrapped around the almond paste in a coiled form. 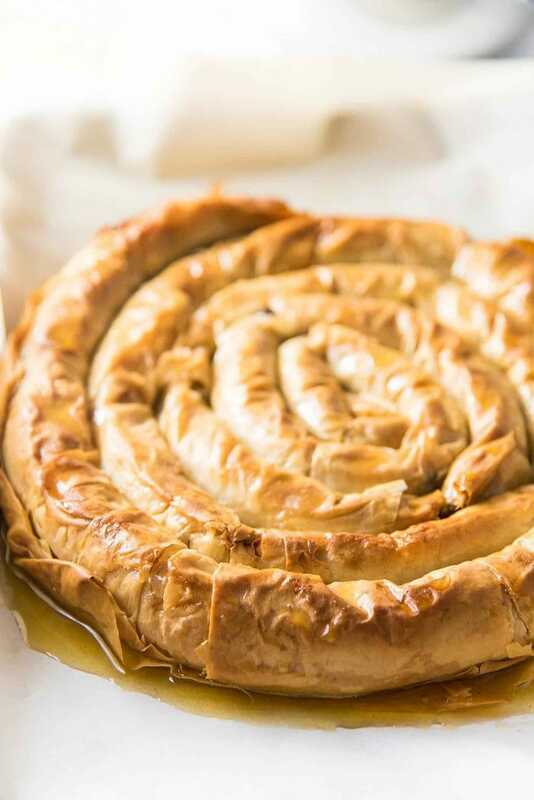 The almond filling is nutty and almost fudgy in texture, and it’s wrapped with crispy, flaky filo pastry that’s been soaked in a delicious honey syrup. Traditionally, Almond M’hencha is made with almond paste flavored with almond extract, powdered sugar, cinnamon and orange blossom water. 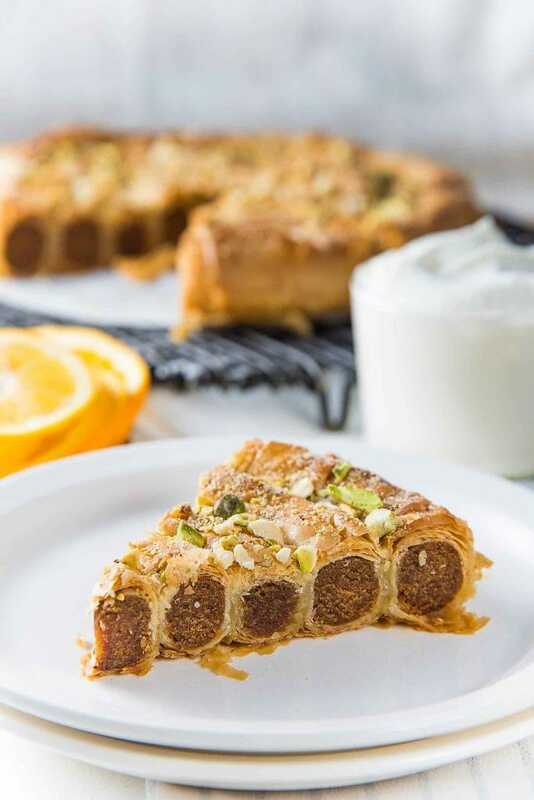 BUT I decided to sweeten the almond paste with dates instead of powdered sugar, and add some refreshing citrus flavors to brighten up the flavor profile of this pastry cake. And instead of the almond paste, I flavored the honey syrup with orange blossom instead. I was able to achieve all the vibrant flavors of this citrus, date and almond m’hencha thanks to Nielsen-Massey products! There’s always a bottle of their vanilla in my pantry, and I’m a huge fan of their pure flavor range as well! It’s really no surprise why Nielsen-Massey products are of such high quality. They are a family owned and managed producer of premier pure vanillas and flavor extracts. They use fewer ingredients to produce their highest-quality products from vanillas to other flavor extracts. Their products are also all-natural, certified gluten free, kosher, allergen-free and GMO-free. For this citrus, date and almond m’hencha recipe, I used lemon and orange extract for the almond paste. Using these extracts saved me the time of zesting lemon and oranges to get the same result in terms of flavor and quality. They add a delightful citrus flavor that perks up the taste of the almond paste. 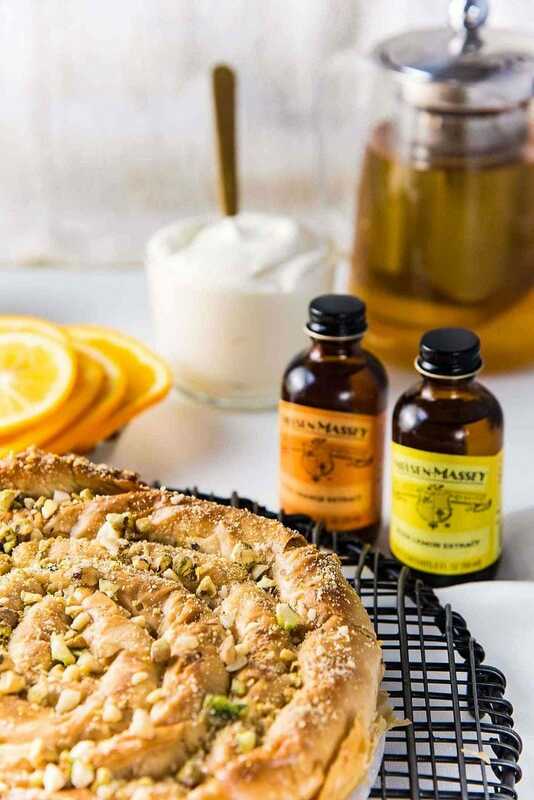 Because these Nielsen-Massey products use a proprietary process to gently extract the delicate flavor without losing any of the sweetness or richness of the original ingredient, you can rest assured that the flavors in the lemon and orange extracts, and orange blossom water are pure and strong. When wrapping the almond paste with filo, make sure the filo sheet is slightly wrinkled as you wrap it. Note the wrinkles in the filo sheet as you wrap the almond paste. This will help when you coil the pastry. Both of these extracts are PERFECT for cakes and desserts. And they pair beautifully with savory dishes too. 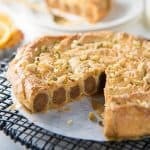 In this almond m’hencha cake, the orange blossom honey syrup complements the citrus flavor in the almond paste and adds a lovely floral sweetness to this dessert. 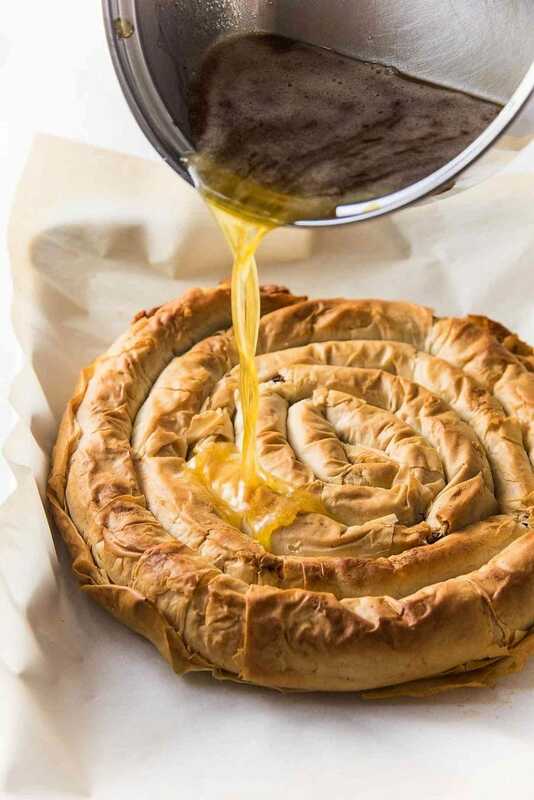 It soaks up the filo pastry and infuses it with that lovely citrus flavor too. Unlike its close relative baklava, neither the almond paste, nor the m’hencha cake as a whole here are as rich and sweet. You can also check out my recipe for Pistachio and Orange blossom marshmallows, where I used Nielsen-Massey orange blossom water. Another change that I had to make to create this date and almond m’hencha, was to use filo dough (or phyllo dough). 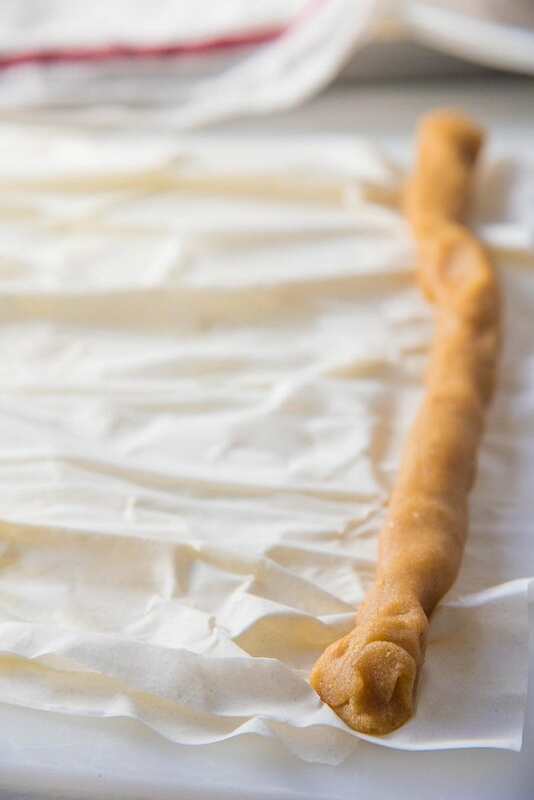 Traditional almond m’hencha uses a dough called Warka which is a traditional Moroccan pastry (also called Moroccan filo dough), but filo pastry is a perfectly acceptable substitute. Use a good food processor to process the almonds. The finer the almonds, the smoother your almond paste will be. But don’t worry even if you can’t process the almonds until they’re very fine. The paste won’t be as smooth, but it’ll still be just as delicious! Soak the dates overnight in water to soften them. I used Mejdool dates, but you can use any type that’s available to you. After soaking, I removed the seeds and the skin of the dates. Be generous with butter or ghee! Filo pastry requires butter or ghee. It makes the pastry particularly flaky once baked. Keep the filo dough covered with a damp cloth to avoid drying out. I had to use two. One for the filo dough stack, and the other for the rolled up pastry. When rolling the almond paste, DO NOT wrap the filo tightly around the almond paste. I created some wrinkles and folds in the filo dough (please see pictures in the post), and then wrapped the almond paste with that wrinkly filo pastry. This is to make sure that the filo pastry doesn’t stretch too much and tear when you bend/coil the cake in the next step. Pour the warm honey syrup over the HOT, freshly baked almond m’hencha, OR pour the HOT honey syrup over the warm almond m’hencha. It is crucial for either the syrup or the m’hencha to be hot, so that the syrup gets thoroughly absorbed by the pastry. The result is this glorious, delicious almond snake cake, that’s not too sweet (surprisingly, I know), but has a uniquely exotic, floral, citrusy flavor profile. It’s an impressive dessert, perfect for any occasion, or as a tea-time snack. If you like baklava, then you cannot miss this almond m’hencha! Place the dates in a bowl. Add just enough water to cover the dates. Cover and let them soak for a few hours, or overnight. Next, drain the water, and remove the seeds and skin from the dates. Set aside. Place the blanched almonds in a food processor. Process on high until you have finely ground almonds. Add the lemon extract, orange extract and dates and process until you have a smooth ball of almond paste. 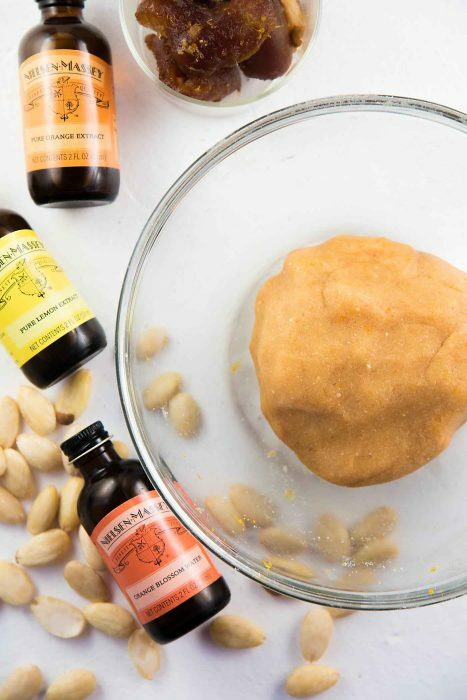 Place the almond paste in a bowl, and mix in the egg yolk. Use a spoon to mix in the yolk until it's fully incorporated. Cover and chill until needed. Preheat oven to 350°F. Unwrap the filo dough on your work surface and cover it with a damp tea towel. Take one sheet of the filo dough and brush it with melted butter. Place a second filo sheet on top. 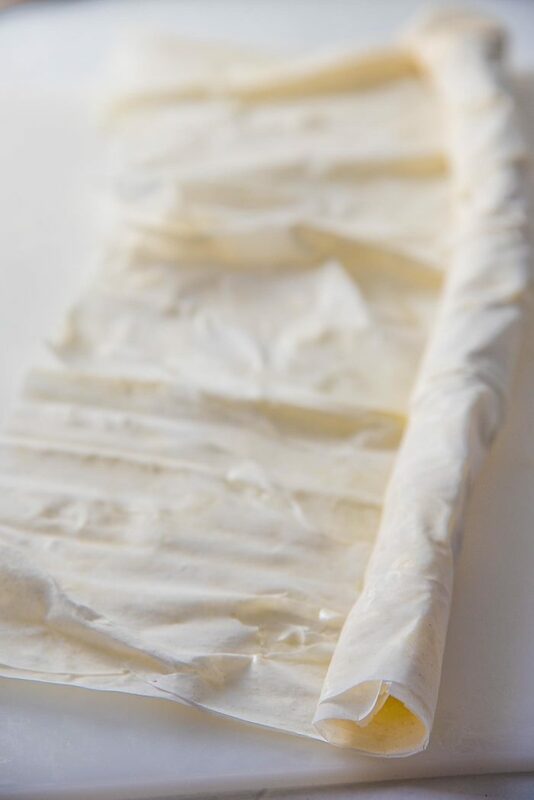 Take ¼ of the almond paste and form a ½ inch thick “snake” (see pictures in post) along the long edge of the filo dough. The almond "snake” won’t be as long as the filo dough, so create some wrinkles in the dough so that the almond paste log fits better. 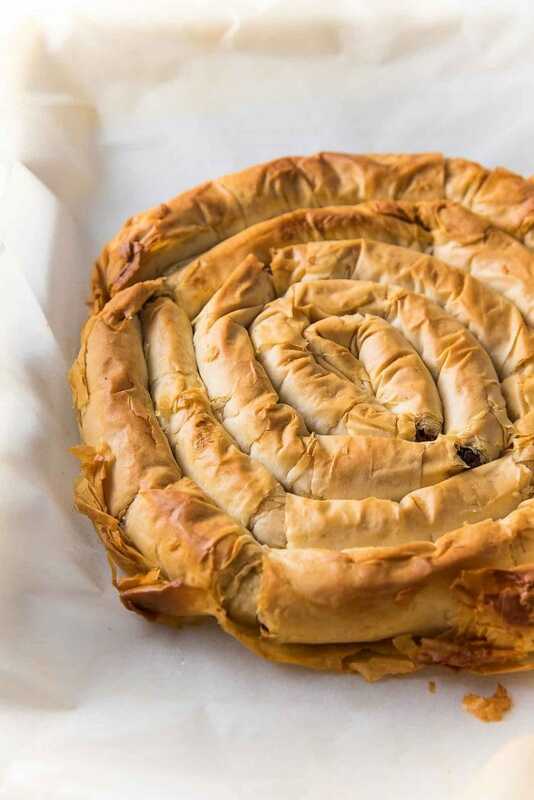 Apply butter on the surface of the filo pastry, and wrap the almond “snake” with the pastry. Make sure that the filo pastry isn’t too tight or taut and there are some wrinkles in the wrapped dough. Gently, bend the wrapped filo “snake” to form a coil. Use melted butter to stick the dough together to keep the shape. The wrinkles in the filo dough should make it easier to bend/coil the pastry. 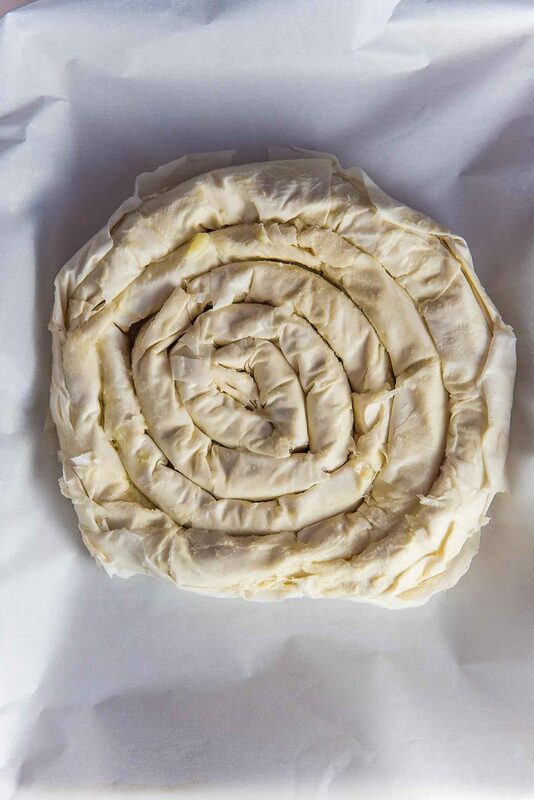 Keep the coiled pastry covered with a damp tea cloth, while you prepare the other pastry sheets. Repeat this process with 2 more filo sheets and another ¼ of the almond paste. Wrap the resulting filo snake around the previous coiled pastry. Repeat this whole process two more times, with 4 more filo pastry sheets and the remaining almond paste. Brush melted butter on the final filo sheet and fold it in half. Brush the top of this with butter, and carefully place the coiled up m’hencha pastry on top. Fold over the edges of the bottom filo to create a “base” for the Almond m’hencha. Then place the m’hencha on a baking tray lined with parchment paper. Bake in preheated oven for about 30 - 40 minutes, until the pastry is golden brown in color. While the m’hencha is baking, get the honey syrup ready. Once the pastry is baked, pour the honey syrup over the pastry as evenly as possible. Set aside for at least 1 hour, until the pastry has thoroughly soaked up syrup. Serve warm, or at room temperature with cold whipped cream, whipped mascarpone or vanilla ice cream. Dissolve the salt in the water and add it to a saucepan along with the honey and orange blossom water. Bring the honey to a boil over medium heat while stirring frequently (to prevent the honey from burning). When the honey starts to foam up, remove it from the heat. It can be used immediately or kept warm until needed. 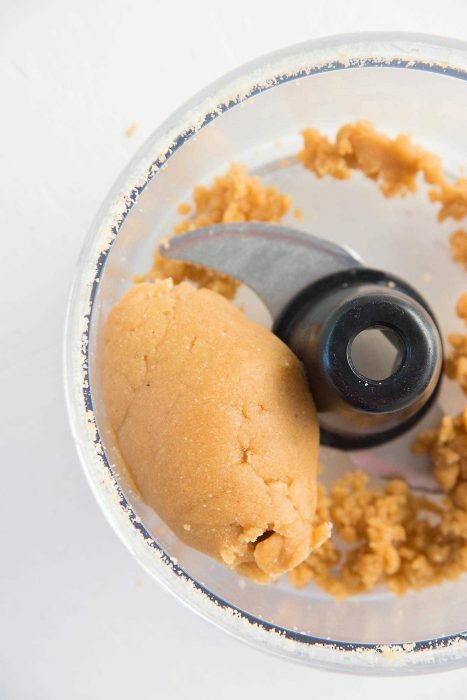 Make sure you check out all the amazing vanillas and pure flavor products from Nielsen-Massey and follow them on Facebook, Instagram or Twitter to see all the incredible recipes that they have too. 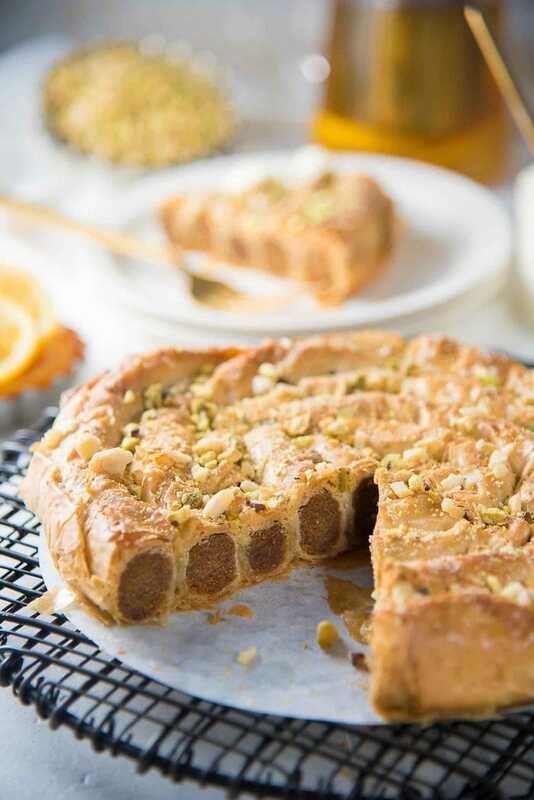 Especially the lemon and orange extract, as well as the orange blossom water, so that you can make this glorious Citrus, Date and Almond M’hencha for your family and introduce them to a unique and delicious Moroccan dessert! 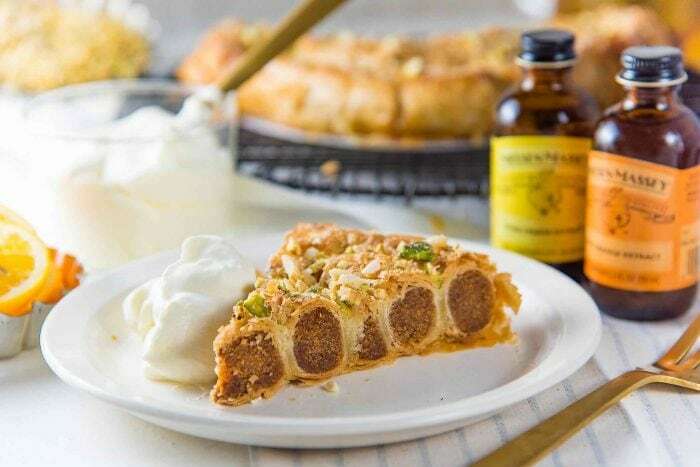 If you liked this Citrus, Date and Almond M’hencha recipe, don’t forget to subscribe for new (and free) recipes by entering your email address on the side bar (and get all these recipes delivered straight to your inbox), so you don’t miss out on a thing. You can find me on FACEBOOK, TWITTER,INSTAGRAM, PINTEREST, YOU TUBE and GOOGLE-PLUS too. Previous Post: « Cookie Monster Cheesecake – Secret Layer Cakes Cookbook!